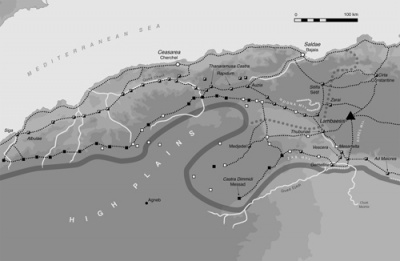 Map of Roman forts in Mauretania Caesariensis, optimised for print in greyscale. It is part of a series of maps that shows the organisation of Roman forts across the whole Roman frontiers area. "...the best set of maps of Roman frontiers anywhere..." David Breeze, former head of Scottish Heritage. Thematic maps for multiple use (print, film, museum display...) are a sort of side product of CHC's internet based information systems. A whole set of maps of the frontiers of the Roman empire can be downloaded via the internet (courtesy of the Austrian FRE Project, produced within the European Culture 2000 project Frontiers of the Roman Empire), others can be obtained via CHC or its project partners. 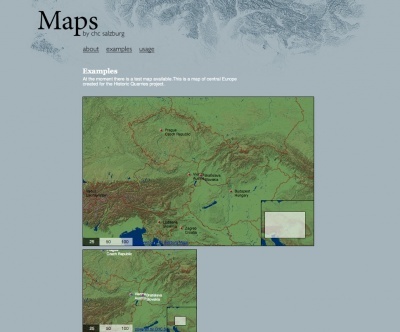 CHC developed a simple solution to display maps on the web. Being part of a public organisation, the University of Salzburg, and working within a number of projects that receive public funding, we belief it is our duty to make our work publicly available. If you have a website and would like to display information on a map, we can provide you with the necessary technology and corresponding map files. Diese Seite wurde zuletzt am 11. November 2014 um 16:26 Uhr geändert.